Data: Customer authorizes Publisher to collect photographs and other descriptive information regarding Customer's properties and listings and to distribute such data through the Publisher and its successor and affiliate websites. Copy and Material: The Publisher reserves the right to revise or reject for any reason at its sole discretion any advertising copy submitted. All advertising materials created by the Publisher remain the property of the Publisher and may not be reproduced in any other publication, website or material without the Publisher's prior written consent. Acceptance of Tour: It shall be solely the Customer's discretion and responsibility to approve the advertising once it has been produced. The Publisher shall notify the Customer via email within two business days of Advertising being produced. The Publisher shall use the email address provided in the online order form or the MLS if no email address is given during ordering. It is up to the Customer to provide accurate email information to the Publisher. Advertising shall be considered approved 5 days after notification to the Customer regardless of whether the Customer has responded or not. It is the sole responsibility of the Customer to insure that the Advertising is linked to the listing in the MLS (where applicable). The publisher provides this service as a courtesy to its Customers but it is not required for the terms of the Advertising agreement to be met. Customer is no longer required to provide access information for posting advertising to the Charleston Trident MLS (CTARMLS). CVH360 uses an automated script for posting advertising to CTARMLS that does not require MLS User ID & Password data. This limits the liability of CVH360 and the Customer. Any errors that occur during the posting of data (tours or pictures) shall be corrected with the assistance of CTARMLS Tech Support to the best of CVH360's ability. CVH360 shall not be responsible for any unintended or improper ordering of the posted images.Customer shall be responsible for rearranging the posted images in the manner that they see fit. Customer is required to provide all pertinent information to Publisher if they would like the Publisher to post the Advertising to any other Multiple Listing Service (“MLS”) or any other website to which the Customer has access. Condition of Property: It is the Customers’ responsibility to ensure that the listing is ready for the Advertising to be produced at the arranged time. The Publisher accepts no responsibility for the condition and/or cleanliness of the property at the appointed time for the Advertising to be shot. The Publisher or its designated Photographer (“Photographer”) will do no cleaning, dusting, moving of furniture, or any other items that may be within the designated shooting area. The Photographer will only, at his or her discretion, adjust blinds, shades curtains, or turn on or off lights as deemed necessary to better capture the scene(s). Customer shall ensure that the agent of the Publisher shall have access to the listing at the time indicated and prearranged by the Customer. Customer shall ensure that the agent of the Publisher is safe and is not disturbed during the scheduled appointment. All Animals shall be kept away from the Photographer unless accompanied by the Customer or Home Owner. Photographer shall not be responsible for Animals/Pets that escape the property during the photography session. If the Publisher arrives at the property and the conditions expressed in Section 4 are not met, even if by no fault of the Customer, the Customer agrees to pay a $45 Trip Fee. Rescheduling of the Advertising shall be at the Publisher’s sole discretion and will not impact the agreement of the Customer to pay for the Advertising. Publisher will dispatch a Photographer to photograph property at such time as agreed upon by Publisher and Customer at time of order confirmation. Any request to modify, reschedule or cancel services must be made in writing at least 24 hours prior to scheduled arrival. If there is no advanced notice of cancelation prior to photographer's arrival and any work is performed but not completed due to home/property not being ready/accesible, there will be a minimum charge of $35 to reschedule and come back to complete the work. All requests for rescheduling must be made in writing by sending an email to support@cvh360.com. Customer is responsible for requesting an appropriate schedule for the Advertising to take place in regard to Tides if that is important to the Property. Publisher guarantees that all significant aspects of the property shall be included in the Advertising unless the condition of said aspect has a negative impact on the Advertising. This shall be left solely up to the Photographer unless specific aspect(s) of the property is specifically requested by the Customer. If the weather threatens to prevent Photography, the Customer shall be given the option to continue or to reschedule. If the Customer decides to continue the Photography session, Publisher shall not be responsible for the outcome of the tour. If, after the option to reschedule is turned down by the Customer, the Customer asks for tour to be re-shot due to unfavorable weather conditions, the Customer shall pay the $35 Trip Charge in addition to the Advertising Costs. Errors: The Publisher’s liability for damages resulting from errors in any advertising that it publishes or from its failure to publish any advertisement that it has agreed to publish shall be limited to the amount it actually received in consideration for its agreement to publish the advertisement in question. The Publisher shall not be responsible for any special, incidental, or consequential damages suffered by any party resulting from its errors or omissions. Ownership: Customer and Publisher agree that all advertising materials created by the Publisher remain the property of the Publisher and may not be reproduced in any other publication, website or material without the Publisher's prior written consent, except as expressed in Section 3(c) and 3(d). Publisher retains the right to republish or repurpose any marketing materials with subsequent listing of a property that may occur in the future, without notice to or consent from the original customer. Life of Tours: We reserve the right to delete/remove from our server(s) any tour that has been SOLD, WITHDRAWN, RENTED, LEASED, or EXPIRED at any time. All ACTIVE tours will be allowed to stay on the server(s) as long as they remain ACTIVE in the MLS. Requests from Customer to maintain their tour online will no longer be accepted. We will make available on digital/optical media any tour upon request prior to deletion. It remains the Customer's responsibility to make such a request in a timely manner. Additional fees may apply for this archiving service. Please contact Publisher to discuss pricing. New Tour Announcements: Every tour produced by CVH is allowed one free New Tour Announcement (NTA) email that is sent to a roster of local Realtors. CVH reserves the right to send these NTA's in the order in which the finished tours are approved, and on any day of Publisher's choosing. CVH also reserves the right to NOT send any NTA for a listing that changes from ACTIVE in the MLS to CONTINGENT, PENDING, SOLD, WITHDRAWN, RENTED, LEASED, or EXPIRED. In the event that a current ACTIVE listing is changed by the customer, they may request that CVH resend the NTA for that listing. CVH reserves the right to limit those resent NTA's to open/available time slots that CVH feels are approriate for updated tours. No updated/resent NTA will take precedence over a new/unsent NTA. It shall remain the Publisher's option to combine what would normally be multiple NTA's for one customer into one NTA in an effort to keep open time slots for other customers who are awaiting the sending of their NTA's. It shall remain the Publisher's option to combine what would normally be multiple NTA's for one agency into one NTA in an effort to keep open time slots for other customers who are awaiting the sending of their NTA's. Hold Harmless: The Customer accepts all liability for the content of all advertising supplied by it. The Customer warrants to the Publisher that its copy is true, that it is not libelous or defamatory, that it violates no rights of privacy, that it infringes no trademark, copyright, literary or other rights, nor constitutes unfair competition with any other party, and that it complies with all Federal, State and Local Laws and Regulations. The fact that copy shall have been submitted to the Publisher for approval and shall have been previously approved by it, either in whole or in part shall not relieve the Customer of this warranty. The Customer agrees to defend, indemnify and hold harmless the Publisher from any and all claims, demands, liability, suits, costs or expense, arising by reason of the publication of the Customers advertisement or breach of the foregoing warranty, whether such claims are well grounded or not. Customer assumes all liability for any authorized or unauthorized redistribution of content created by Publisher. Inability to Perform: Neither party shall be required to perform any term or condition so long as such performance is delayed or prevented by computer, telecommunications, or other system outages, or force majeure, which shall mean acts of God, strikes, lockouts, material or labor restrictions by any government authority, civil riot, floods and any other cause not reasonably within the control of the performing party and which, by due diligence, such party is unable, wholly or in part to prevent and overcome. Invoiced Clients: Invoice shall be sent to Customer within 15 days of the completion of Advertising. Customer shall pay said invoice within 30 days of the date of the invoice (unless otherwise stated on the invoice). Payment is required regardless of listing status at the time of completion of the Advertising and shall not be dependent on explicit approval of the Advertising by the Customer. Service Charge: A service charge of 5% per month or the maximum rate allowed by law, will be applied to all past due balances. A service charge of $35 and any associated late fees will be incurred in the event of a returned check or invalid credit card. 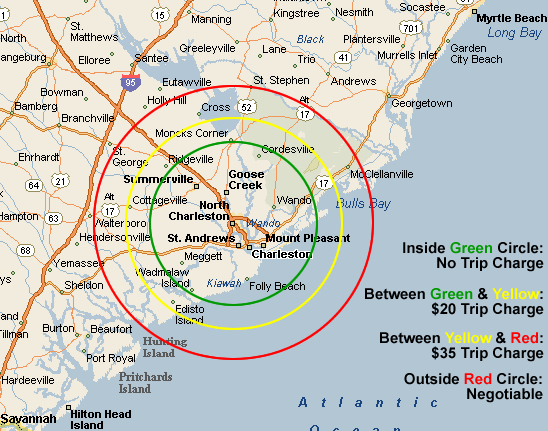 Publisher offers its services throughout the Charleston Metro area. However, certain properties will fall outside of the Publisher's standard service area. For a map of the service area(s) and any applicable "trip fees", please see the Service Map. Attorney and Collection Fees: If for any reason payment is not made in full when due, the Customer agrees to pay any and all Attorney and Collection fees and any Court cost incurred by Publisher. Refund/Return Policy: While payment is required up-front, should the Client need to cancel an order or is not 100% satisfied with the finished product, Publisher will gladly refund the Client's charge to the credit card used to place the order. Client would need to send an email to support@cvh360.com requesting the refund and provide the last 4 digits of the card used, and Publisher will refund Client's charges within 24 hours. Any products produced up to that point will be removed from the Publisher's server(s), and any future use of Publisher's work would be disallowed. Any unauthorized continued use of the Publisher's Advertising may result in a new charge. We reserve the right to amend this Agreement from time to time and will notify you of any such changes by posting the revised Agreement on the Site(s). You should check this Agreement periodically for changes. All changes shall be effective upon posting. Your continued use of any of our Services after any change to this Agreement constitutes your agreement to be bound by any such changes. We may terminate, suspend, change, or restrict access to all or any part of the Services without notice or liability. Cookies are a feature of web browser (Internet Explorer, Netscape Navigator, etc.) software that allows web servers to recognize the computer used to access a website. They are small pieces of data that are stored by a user's web browser on one website to simplify subsequent interactions with that website by the same user or to use the information to streamline the user's transaction on related web pages. This makes it easier for a user to move from website to website and to complete transactions over the Internet. Cookies should make your online experience easier and more personalized. If you contact us with questions or to request information, we may contact you through whatever Personal Information you have provided to us regarding the information requested or other information we think may be of interest to you. We use Other Information to gather information about our Users and to enhance and design our website to make it easier, faster and friendlier for you to use. Additionally, cookies help us know information about how many people visit our website, when they visit and how they use our service. We do not connect any of this information to your Personal Information or email address. You may be able to access third parties' websites or information through our website. We do not endorse or warrant third party's services, products or information and we do not provide Personal or Other Information to any third party unless you so request. When you visit third party websites and purchase products or services, you are doing so from such third party websites, subject to their terms and conditions, policies regarding privacy and data collection. When you choose to use such sites, you should read such policies to be sure you agree with them. We may be required by law or government agency to disclose both Personal and Other Information you have provided to us and will do so if required. If you choose to communicate with us via email, your information may not be secure and may not arrive in a timely fashion. Therefore, if you choose to communicate with us through email, you are assuming the risk of doing so and we request that you do not send sensitive or urgent information through email. We will use reasonable commercial efforts to secure Personal Information you provide us via phone or mail in the normal course of business. If you wish to access, delete or correct any information you have submitted to us, please send us an email at: updates@cvh360.com. We reserve the right to revise this policy at our discretion. Please check back on this website as this policy may be revised from time to time without notice to you.